Before I took much of an interest in cooking, making a grocery list was mostly a quick task. I tended to buy the same highly-processed, high-sodium, quick fix staples (like frozen or boxed dinner kits), so all I needed to do was just write down which toiletries were necessary to purchase that trip. Nowadays, making a list turns into a whole ordeal. Usually I make it the day before I even grocery shop. It starts with my recipe box and whatever cookbooks I have. Today I have to make a list and I have four cookbooks sitting on my desk here in a pile. I plan on making all new meals this trip- three of these books are brand new (yay Christmas!) and the New Year brings the desire to start eating healthier. 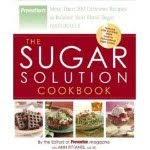 One book, The Sugar Solution Cookbook, I found on amazon.com. I'm hypoglycemic (meaning I over process sugar, like reverse diabetes) and was in need of some new recipes that would make my meals last longer for me. I eat a meal and am hungry to the point of panic 2-3 hours later. As I type this, I'm eating lunch #1, and it's 9:55am. I'll be having lunch with my in-laws in an hour and a half and will have no problem eating then too. All of this eating without regard to what my meals consisted of has led to me feeling very blah this past few weeks, especially thanks to the holidays, so I am excited about this grocery trip- my first real attempt at replacing most meals with healthier food. This includes slow carbs, high fiber and whole grain meals. Less white pasta- more whole grain pasta. Brown rice instead of white. More fish and chicken, more herbs and seasonings and less salt. 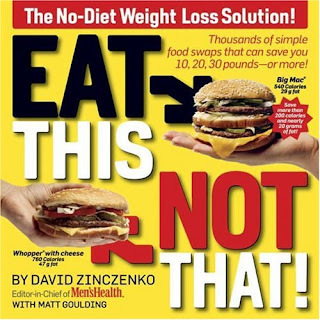 I am currently very interested in "eat this not that" information. I was excited to see that sweet potatoes are GOOD for you, especially compared to regular potatoes! No more regular spuds for me. 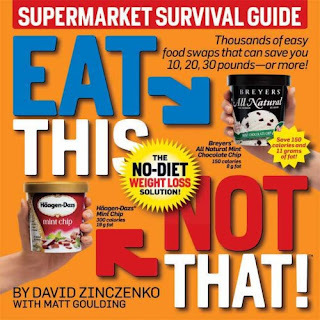 Speaking of "eat this not that," there is a line of books out there that does a fantastic job of pointing out great replacement choices at the grocery store or at restaurants. I'd eventually like to own these books myself, but I gave one to my sister for Christmas and she likes it- she says it makes her think while at the grocery store about what she's really buying. The calorie savings add up, and you might not even notice the difference in taste. Long story short here is that with some extra planning on your grocery list, you can make meals that are so much healthier but don't compromise on flavor or the ability to fill you up. I'm excited to pick out and try some new meals, and I will be posting the successful ones (hopefully all of them!) on this blog as I make them. That's not to say I won't still make the comfort foods I like to make, of course. I'll leave a day or two a week for eating "bad" dinners. But 5-6 planned healthy meals a week will hopefully make a big difference. yes! i tried butternut by just cutting it into chunks and roasting it- it was great! spaghetti squash is fantastic too!